Breaking: Oktovianus Pogau, West Papuan Journalist, dies. Rest In Peace Oktovianus Pogau. West Papua has lost a dearly loved comrade journalist, Oktovianus Pogau, to complications from lung disease, at the Dian Harapan Hospital in Jayapura, West Papua, at around 9.30pm, on Sunday January 31. West Papua Media expresses the deepest condolences to his family and close friends for the loss of our great friend, a hero of Papua and a crusading journalist. Many friends of West Papua Media will also be friends of Okto and be familiar with his amazing work. As a member of the Mee Pago from Intan Jaya district, Okto was a pioneering voice for West Papuan youth, a dedicated and brave journalist who fearlessly covered the aspirations and demonstrations of Papuan desire for liberation. We counted on Okto as a founding source and undercover journalist, and a key plank of our verification program for fast and accurate international coverage of events in West Papua. Okto went onto found and become the Editor of www.SuaraPapua.com (Voice of Papua) and http://pogauokto.blogspot.co.id/ , where he daily wrote of Papuan aspirations for liberation, despite a heavy cost, including several arrests and severe beatings by the Indonesian security forces for his tireless advocacy. One such event caused Okto Pogau to become internationally recognised as a journalist at risk, after he was severely beaten and choked by Indonesian Police at a demonstration in Manokwari on October 23, 2012. Coverage and advocacy of this outrage caused the head of Police to be forced to apologise to Pogau and offer a degree of compensation. However Okto simply continued on with his work without fanfare. West Papua Media is also proud to have collaborated with Okto closely for several groundbreaking stories, including his gathering of torture footage in 2010 that changed the international dialogue around West Papua and shone a bright light on the impunity of the Indonesian security forces and their treatment of West Papuan civilians. Okto had just returned from a journalism fellowship in the United States prior to his sudden severe illness, brought on by respiratory issues that plagued him for most of his life and shared with many of his countrymen. His body has been interred overnight in the intan Jaya hostel for transport and burial in his home village, and a memorial service will be soon announced. you were a friend, a comrade journalist, and unbelievably brave man. Your dedication for the truth was an inspiration to so many young Papuans who have followed you into the new journalism that tells the truth of Papuan experience and aspirations. Your words gave voice to the suppressed voice of youth, and you resisted constantly the threats from the Indonesian state to alert the world to both the dreams of freedom and the cries of suffering in West Papua. Okto, you were a pioneer in so many ways, and were responsible for shining a light on some of the darkest secrets of West Papua’s suffering under Indonesia. You copped so much suffering yourself from the State, but still managed to tell the story about others. 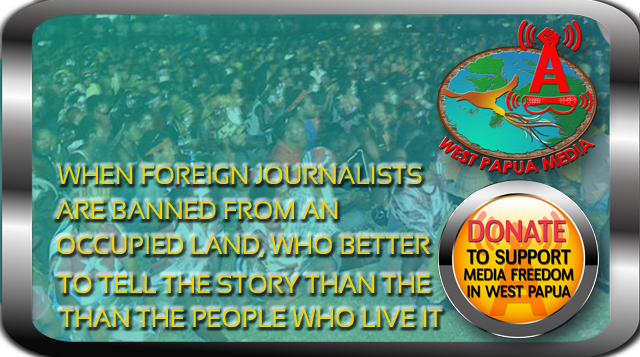 As a founding source, stringer and adviser to the internationally focused West Papua Media network, you created a new level awareness of the situation in Papua and around the world. As a child of the Mee Pago, you have made your people very proud. My deepest sympathies go to your family and friends, and your tribe. Papua has lost overnight a bright star, but the star will keep shining for many others to follow. I am deeply sorry brother that your last days were in such pain, but you achieved so much in your young life. This is a great shock to us all. Only the good die young. Farewell young brother, comrade journalist. You are going to be very sorely missed. with love and respect for a life full of achievement cut too short. go well into the light.